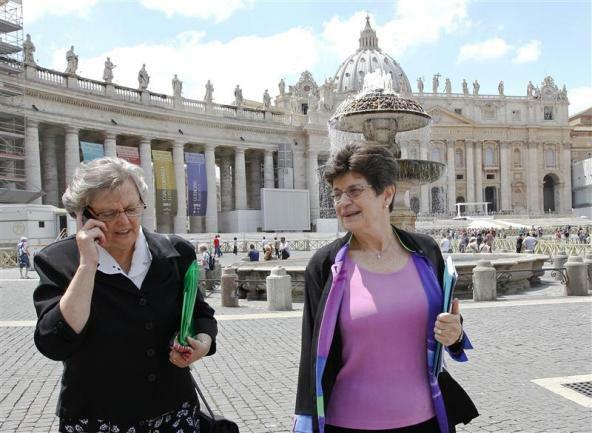 Sister Pat Farrell (wearing purple), president of the LCWR said that questioning doctrine should not be a bad thing. She claims that this (not allowing questioning) is not a "healthy" thing for the Church and that questioning doctrine is not rebellion. It can be a genuine search for knowledge and truth. It can be an attempt to knock what's being questioned down and replace it with something else. We should strive for the first form of questioning. As a former Atheist I had many many many questions - I still do. However, my questions are my attempt to learn and grow more intellectually so that I can assimilate that into my spiritual growth. I don't question to be a pain in the neck or to demand change. This should never be the form of questioning we should take. 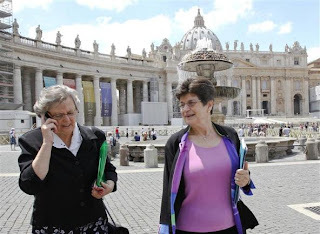 Sister Farrell should realize that the Church is not a democracy or a republic.